The seaview villa "THE TERRACE ON THE SEA" is an amazing detached house with every confort. It is located in TRE FONTANE in the Southwest of Sicily and it has the longest and largest sandy beach in Sicily (10 km). 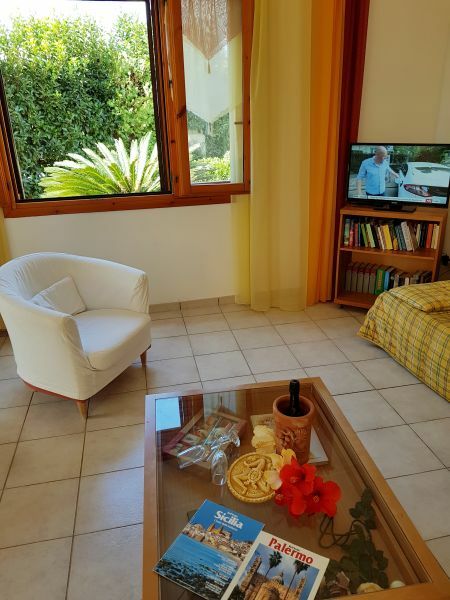 The villa is in a quiet private Residence made up of 20 private villas of 120 square meters each, built in Mediterranean style, Sicilian terracotta and with well-kept gardens. "THE TERRACE ON THE SEA" has 8 beds and is equipped with every comfort. Surrounded by sweeping views of colourful Sicilian sunsets "THE TERRACE ON THE SEA" offers a stylish villa with 3 air conditioned bedrooms, separate air-conditioned living room with a complete kitchen overlooking the garden. 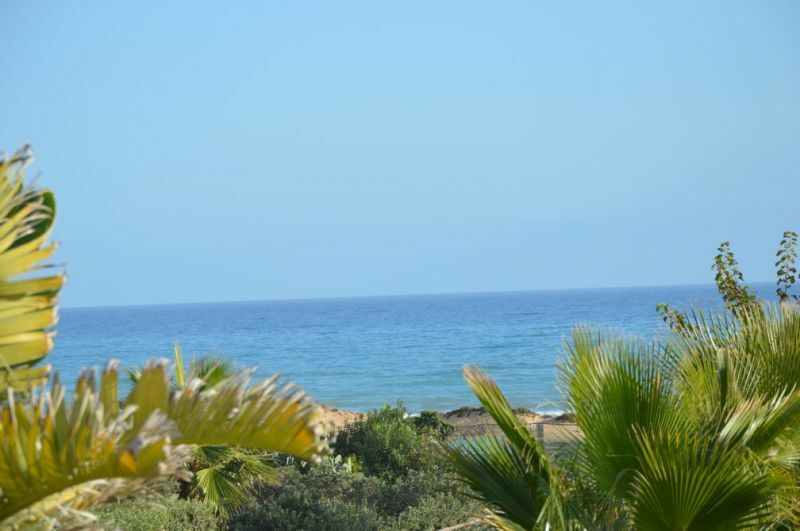 Moreover it benefits of 2 outside verandas for dinner and a wonderful equipped terrace overlooking the sea and the lawn. Private free parking. 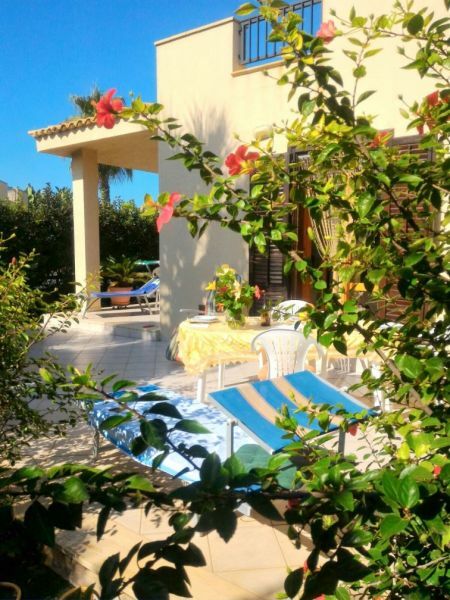 It is located on the ground floor with direct accesss via a private road (70m) to a wonderful sandy beach with shallow water perfect for swimming so it is ideal for families with children for its privacy. From " THE TERRACE ON THE SEA" you can enjoy the low level of the sea and have your short sightseeing tours to the nearby picturesque salt pans of Trapani (40 minutes), the medieval village of Erice (60m), the Arab-Norman city of Palerme (60m), the archaeological park of Agrigento (60m), the Arab-Norman city of Mazara del Vallo (15m), the Temple of Segesta( 30m), and excursions to the Aegadian Islands with Favignana, Levanzo , Marettimo . 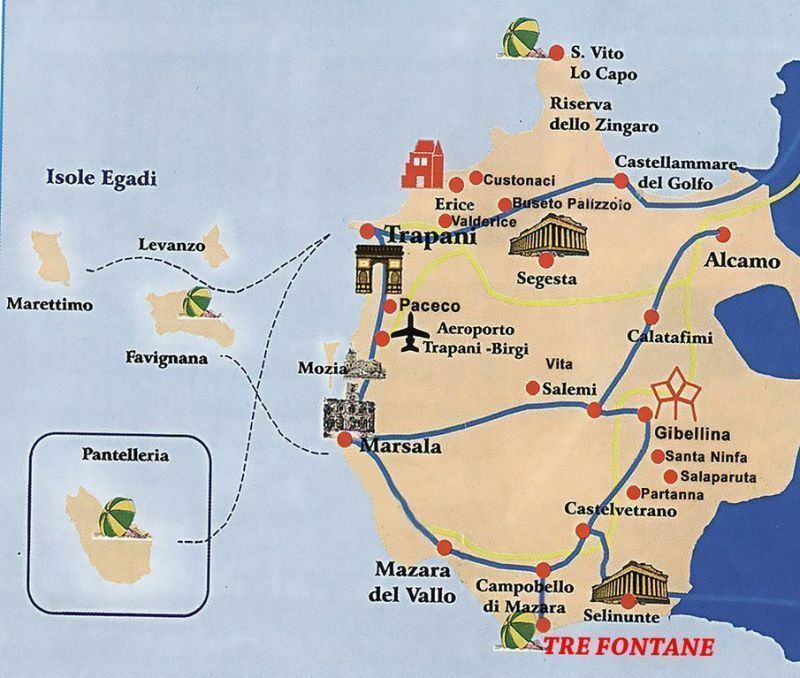 "THE TERRACE ON THE SEA" is only 90 km by motorway from Palerme airport and 45 minutes drive from Trapani Airport. 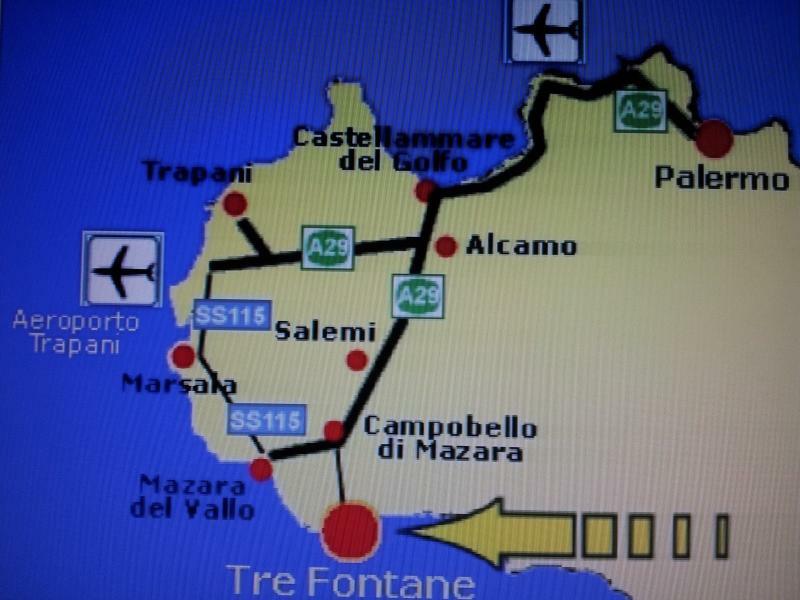 - Airport of Trapani and Palermo - A29 motorway exit Campobello di Mazara, after 8 km you arrive at the seaside resort of TRE FONTANE. - By train Palermo-Trapani railway station Campobello di Mazara. Beautiful house, comfortable, close to the beach. We had a great holiday thanks to the kindness of Nino and Dolly, the owners of the house. 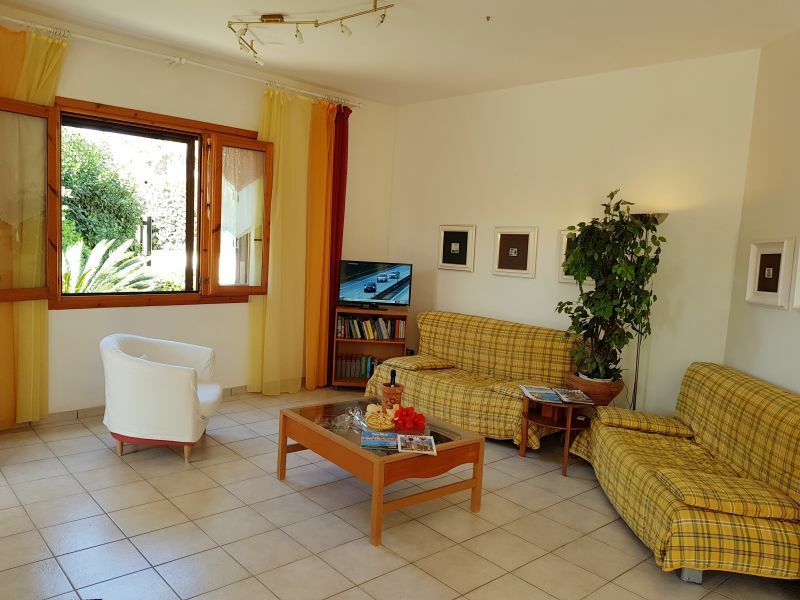 This house in a quiet area, is ideally located to visit all of Sicily. Thanks to Nino for all his good advice both culinary and tourist. Belle maison, tout confort, à deux pas de la plage. Nous avons passé de superbes vacances grâce aussi à la gentillesse de Nino et Dolly, les propriétaires de la maison. Cette maison dans un quartier calme, est située idéalement pour visiter toute la Sicile Africaine. Remerciements à Nino pour tous ses bons conseils aussi bien culinaires que touristiques. Ce fut un plaisir de vous avoir satisfait. Nous vous remercions parce que vous êtes des gens gentils et très bons. Nous espérons vous accueillir à nouveau. Beautiful holiday in a cozy house and equipped with every comfort with a quality-great price ratio. Very friendly and the owners also available for all "straight " necessary for the visit of this area of ? ?Sicily rich in nature, history and culture. 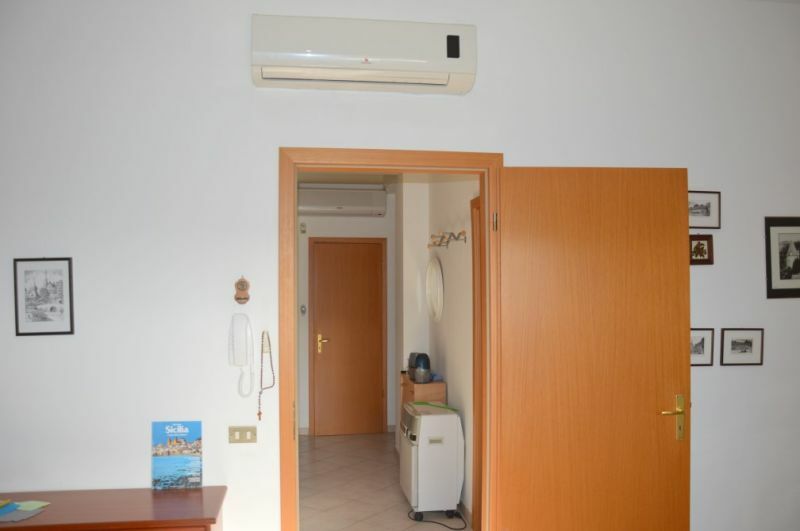 Bellissima vacanza in una casa accogliente e dotata di ogni confort con un rapporto qualità-prezzo ottimo. Molto cordiali e disponibili i proprietari anche per tutte le "dritte" necessarie per la visita di questa zona di Sicilia ricchissima di natura, storia e cultura. Hi to all that are interested in renting. We have spent 2 weeks (end of September 2016) in Villa Valery and it was one of our best holiday ever. The place is beautiful and quiet. The Villa is exactly as described and as in photos. It is full equipped so we did not miss anything. The center from Tre Fontane is aprox. 3 km and Lidl 10 km from Villa. Besides that there are many interesting places to visit but it is useful to have a car. The host is very friendly and helpful and live in neighbourhood. I really recommend. We have come back really relaxed and we will for sure come back. Thank you Antonino :-) ! We are absolutely satisfied with the accommodation. The proof is that we the fourth time to spend our holiday in 2017 at the family Bono. I want to thank you again for the friendly and helpful reception by the Bono family. Wir sind mit der Unterkunft absolut zufrieden. Der Beweis ist, das wir für 2017 das vierte mal bei der Familie Bono unseren Urlaub verbringen. Ich möchte mich noch einmal für die freundliche und hilfsbereite Aufnahme durch die Familie Bono bedanken. Thank you very much. It was a pleasure having you as guests in Giovy's villa. Hoping to see you again. The villa east 120 m2 avec la terrasse extérieure couverte que en Italie doit etre considerée. La villa est 120 m2 avec la terrasse extérieure couverte que en Italie doit etre considerée. In May - July 2015 we were vacationing at this villa with our two little kids. Evrything was good enough. The villa is exatly as in the pictures, the discription is also correct and full. The owner - Mr. Bono - attentive and caring person, whose English is perfect! We have spent 6 weeks in this villa, and Mr. Bono was always ready for any support we requested. The place is excellent for families with kids. It is very quiet (except Saturdays and Sundays, when you can hear music from aquapark near by). The territory of the villa is fenced, so our kids explored it all. There is no vehicular traffic near the villa, so no danger for kids. Mainly, during the period of our stay, the temperature was comfortable both day and night, so we swiched on air conditioning only several times at the daytime. The beach is really 80 meters from the villa. There is shallow entry into the water, need to go 20-30 meters that water reaches the mid-thigh. The wave usually is not high. So it is very comfortable for little kids, they will not affraid of water. Tre Fontane is a small town, francly speaking, - a village. There are some shops, bars, farmacy. Big supermarkets, such as Lidl and Eurspin, can be found in the suburb of another town - Campobello di Mazara. It is only 6-7 kilometers from the villa, but the only way to reach it is by the car. From my point of view, rental car is definitely needed to feel free to move around. Great attention to detail, complete with every tool, exceptional cleanliness. Grande attenzione ai particolari, completa di ogni utensile , pulizia eccezionale.